A couple weeks ago, Chris and I took a spur of the moment trip to Miami and Fort Lauderdale. He had to go for work and I tagged along because sun, beach, and vacation. And isn’t that reason enough? I still had to work during the weekdays, but Chris and I decided to do an early celebration of my birthday on Saturday. 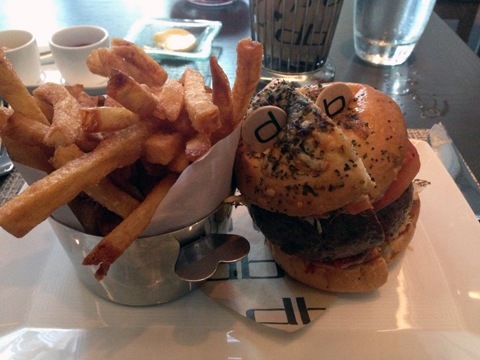 He told me to pick out a restaurant and after lots and lots of research and deliberation, I chose Daniel Boulud’s db Bistro Moderne. 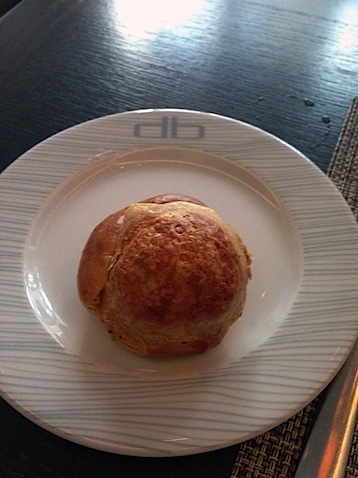 I think it’s probably every food lover’s dream to go to NYC’s Daniel and since I don’t quite know when my chance will be, I figured I could get a little taste of Boulud’s cuisine in Miami. It was definitely the right choice. According to their website, the restaurant “shares the energy and style of its renowned Manhattan counterpart, tailored to the rhythm of Miami life.” We had dinner on the early-ish side (6:30) and the restaurant was so bright and cheery and yes, modern. The table they brought us to had booth seating with both table settings on the same side of the table. This is my favorite thing in the world as I’d so much rather sit NEXT to my husband at dinner, rather than across from him. 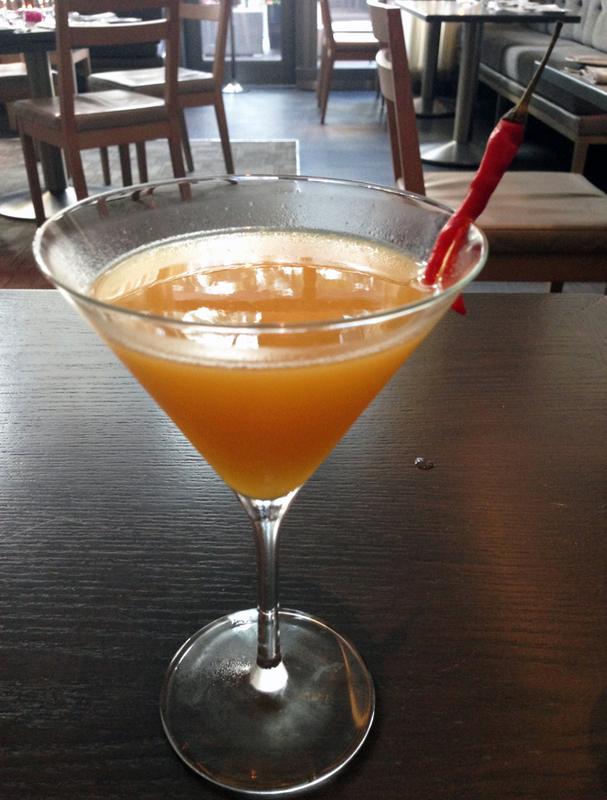 Obviously we started with cocktails. 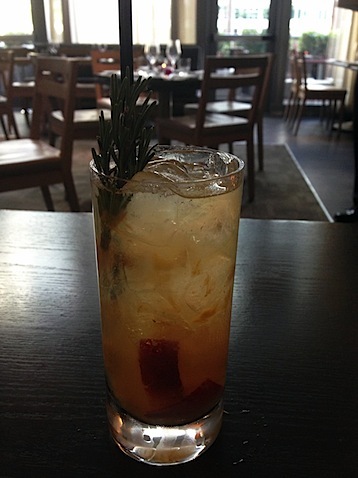 I went for the New Fashioned, which was made with High West Silver Oat Whiskey, Dolin Blanc, Peach, Lemon, and Brown Sugar. Perfect way to start a Miami dinner. Chris got the Fuego Tropical because if there’s a cocktail with the word “fuego,” “hot,” “spicy,” or “hell” on a menu, he’s totally getting it. This one had Sombra Mezcal, Bittermens Hellfire Habanero Shrub, and Passionfruit. I need to learn to make this one at home! 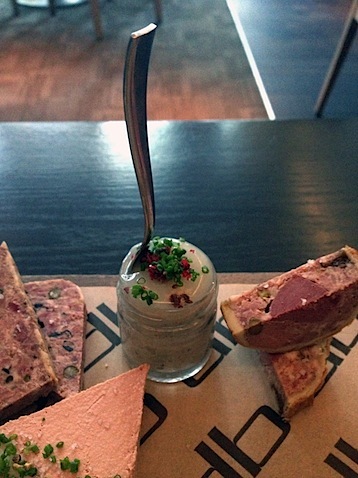 A little complimentary starter of a traditional French gougére was brought to us. Our waiter was pretty fabulous and offered us plenty or recommendations. We had a really tough time deciding on appetizers (lump crab and melon salads and more! 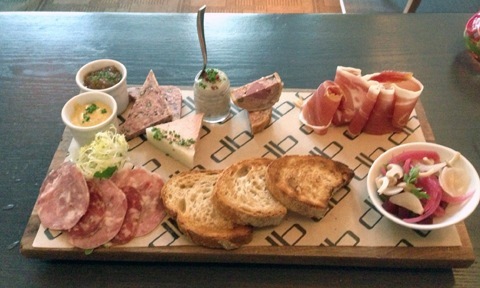 ), but eventually decided we had to get the charcuterie. I really, really wish I could remember everything on this platter (should have written it down! ), but from the photo alone, I think it’s clear, this was a good choice. We ate the entire platter (slash it was mostly me). Onto the entrees! 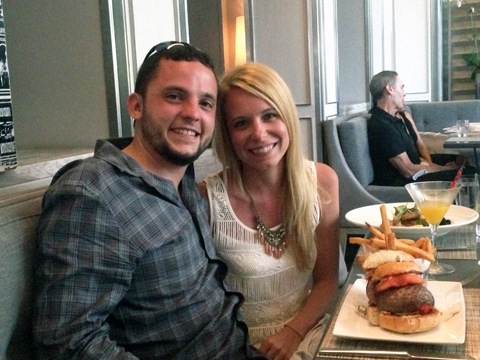 Perhaps you think ordering a burger at a spectacular French restaurant is a weird decision. 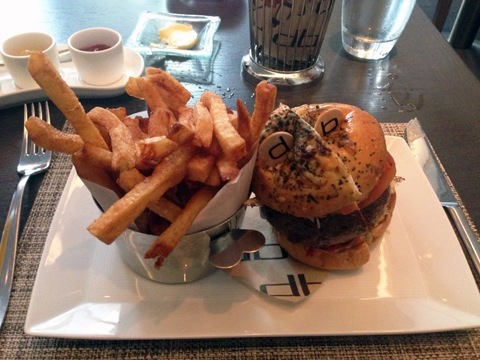 But we had heard so much about Boulud’s burger that Chris had to go for it. I couldn’t blame him… Listen to the description: Sirloin Burger, Braised Short Ribs, Foie Gras, and Black Truffle Served on a Parmesan Bun. Best burger ever? Chris said yes. Can you even call this a burger? I’m not sure. I feel like it just doesn’t aptly describe the full delight of this. I ordered the Florida Red Snapper (when in Florida, right?) 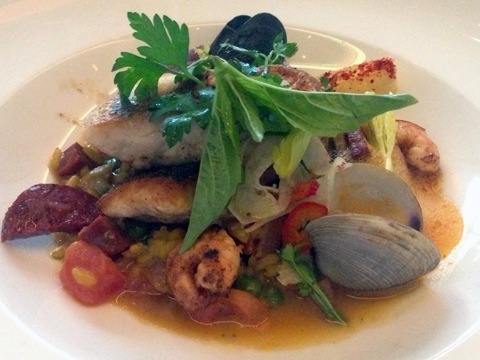 with Saffron Risotto, Mussels, Clams, Laughing Bird Shrimp, and Piquillo Pepper Emulsion. I think our entrees are proof that Daniel Boulud knows how to mix the best possible ingredients together for a meal that will blow your mind. At this point, we were both ridiculously full, but you know I cannot go to a new restaurant and not oder dessert. That would just be wrong. 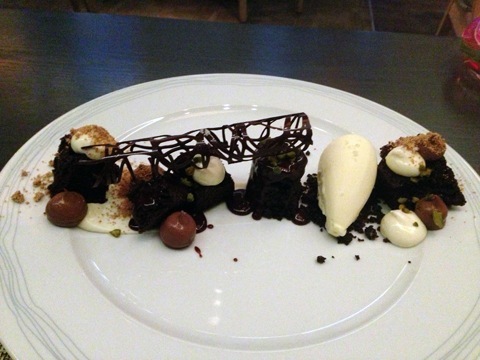 So, we went for the Deconstructed Chocolate Cake. Helloooo. Chocolate cremoso, Frangelico frosting (!! ), and Sicilian pistachio cream cheese ice cream. Best presentation and decadent dessert. We (yup, I) ate all of it. We met a super sweet couple sitting next to us (they said db Bistro was one of their very favorite spots) and they snapped our photo. 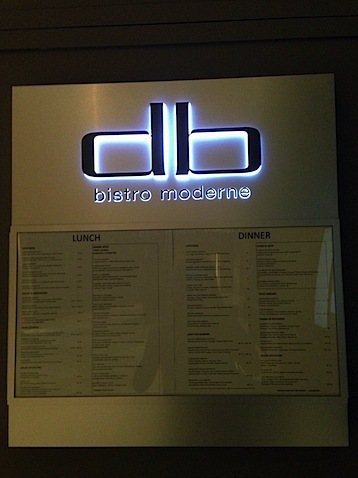 If you ever pay a visit to Miami, I highly recommend dinner db Bistro Moderne. In my opinion, it’s the best kind of French restaurant because it’s incredibly upscale food but not overly stuffy. You can dress to the nines or you can wear nice jeans and a nice blazer and fit in perfectly. The staff is friendly and accommodating. The only negative of the evening? It wasn’t until much later that we realized db Bistro automatically charges an 18% gratuity on all parties. Since we tipped 20% on top of that, that means our waiter had a very good night. Our fault since we should have reviewed the bill better, but it would be nice if they would mention this at some point! Luckily, we loved the service we had! My experience at db Bistro has me even more excited over the fact that Daniel Boulud is coming out with a new cookbook soon. There’s a video trailer for the book and I promise that once you watch it, you’ll be pre-ordering the book, too! 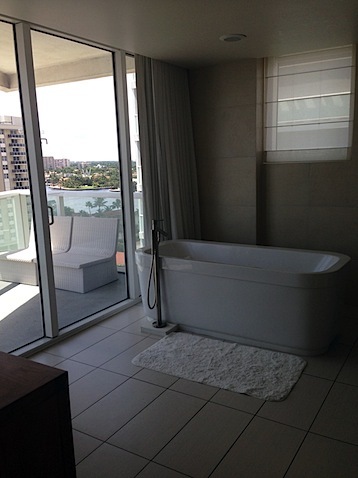 I didn’t document much of the rest of the trip, but I have to write a note about the W Hotel in Fort Lauderdale. Seriously one of the BEST hotels I’ve ever had the pleasure of staying at. We’re Starwood members so always try to stay at a Westin, Sheraton, W, etc. when we travel and occasionally use points for the rooms. We got an upgrade at the W and our room was out of control awesome; more like an apartment than a typical hotel room. 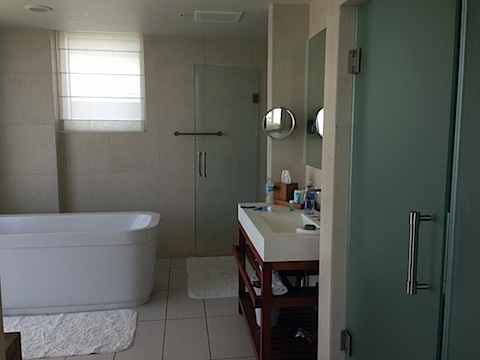 But the bathroom was hands down my favorite spot. Check out that tub! Along with a beautiful walk-in shower and plenty of space for all our stuff. The W also had a sweet hotel bar (and a club, which we refrained from visiting) and a pool (with a glass bottom) that we spent a lot of time at. But really, I just wanted to move into the bathroom. Is that so wrong? Have you been to Miami or Fort Lauderdale? What are your favorite spots? 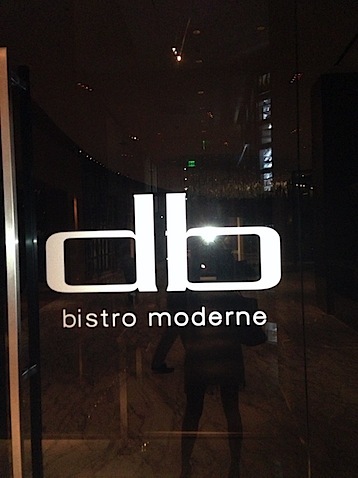 15 Responses to "db Bistro Moderne in Miami"
What a fun getaway! That bathtub looks awesome!! And your dinner out looked great, especially that dessert. Wow that hotel looks amazing! My family has started to go to Miami after Christmas every year, so we may have to check out this restaurant this year. That dessert alone looks worth it. However, I will definitely remember that gratuity thing. I’ve never been to a place that did that unless the party was really big! They should definitely warn you! That is AMAZING…. looks like you guys had a great time! I went to Miami a few years ago and haaaated how all the restaurants automatically charged 18% gratuity. Thankfully, I didn’t have a bad meal there…but still. 😉 This restaurant sounds fabulous! Everything about this meal looks perfect. I need a trip to Miami! What a nice way to celebrate your birthday. A restaurant of that caliber should have come to the table and let you know that a tip was already included in the bill before you left. We used to live in Miami and there are many restaurants that do this…it is a shame. oh my goodness, I need that burger now! You guys look so cute! And happy. And I can see why after eating that meal!! !